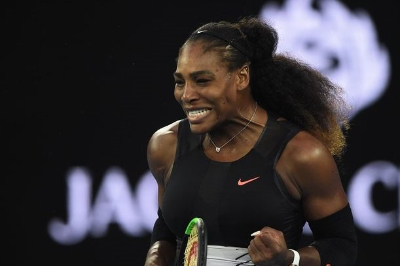 Serena Williams beat her elder sister Venus to clinch her seventh Australian Open title. Serena, with record 23 singles titles, and Venus, with seven, have together almost half of the 67 Grand Slam titles they have competed in since 1997. 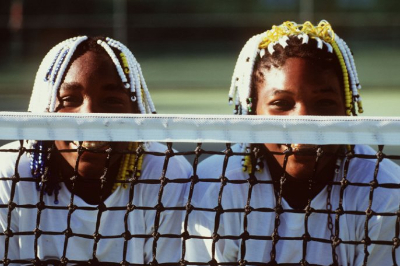 Two poor African-American sisters who grew up in the most gang-ridden part of Los Angeles and practised on public courts have broken every stereotype to win major tournaments and all hearts. What unravelled at the final? 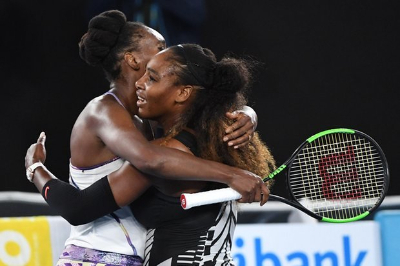 Serena and Venus swept through their previous four encounters at the Australian Open to set up the family final on Saturday with Grand Slam title on the line. Serena and Venus, for the ninth time in their careers and the first time since 2009, squared off in a Grand Slam final. Serena was going for her 23rd Grand Slam title - an Open era record - while Venus was looking to win her eighth Grand Slam title. It was a nervous start for both of them with the first four games having service breaks. The Williams sisters slowly warmed up to the occasion with their returns. They never quite had the rhythm going with their serves. Serena put in a little more fight than Venus to wrap things up in 82 minutes. She had her elder sister beat 6-4, 6-4 to hoist the Australian Open trophy for a seventh time. Why was the contest special? The last time they faced each other in a Grand Slam final was in Wimbledon in 2009. It had been eight years since and here they were turning the clock back. While nobody doubted that Serena will one day break the Open era record, very few thought she would get to do it against her elder sister. 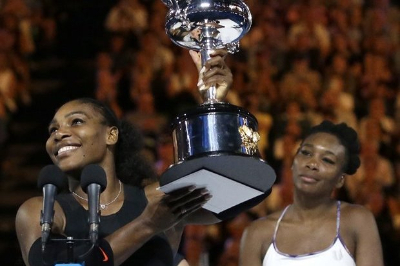 The last time the two squared off at an Australian Open final, Serena held the upper hand. This time Serena went into the contest looking to surpass Steffi Graf’s record for the most Grand Slam titles (22) in the Open Era.Venus Williams, 36, hadn’t reached a grand slam final since 2009. 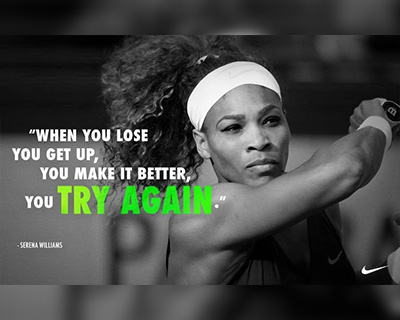 Serena had been battling shoulder injury for four months, and was finding her feet coming into the tournament. In 2011, Venus was diagnosed with Sjogren's syndrome. The disease causes the mouth and eyes to dry out and is autoimmune. This could lead to diminishing strength causing joint and muscle pain, coughing, and limb numbness. To comeback from there to end an eight-year Grand Slam final drought is an achievement in itself. That she could become the oldest woman — and the second oldest player — to win a Grand Slam in the Open Era made it all the more interesting. Going into the final, the two had a combined age of 71 and shared 29 majors between them. This meant that no matter who won the major, they would take home their 30th Grand Slam trophy. The Australian Open is at the core of their storied rivalry, one that Serena leads 16-11. The Williams sisters have together won 30 of the 67 Grand Slams they have participated in since 1997. This phenomenal record will most likely be never broken. When did the sisters first clash on the court? The first time they clashed was in a tour match in 1998 at Melbourne Park. They were both teenagers with cornrows and coloured beads in their hair. They faced off at the second round where a 17-year-old Venus won in two sets. Venus won the encounter 7-6, 6-1. She later hugged Serena and apologised for having to “take out” her younger sister. However, that meeting didn’t foreshadow what would unravel in the next two decades. And even Venus knew this. “I see us as the No. 1 and No. 2 seeds, interchangeable,” Venus said after the game. In 1999, they were no longer meeting in the early rounds. They had started clashing in finals. The first one at Miami (1999) was won by Venus in three. Serena made up for it by notching up her first win over her elder sister at the now-defunct Grand Slam Cup in three. 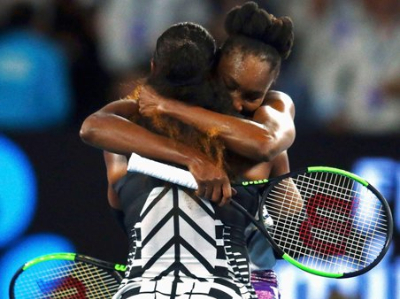 19 years later, the Williams sisters added a new chapter to their rivalry, as they met at Melbourne Park where it all started once again. Venus marked the occasion of Serena’s record win with a powerful speech that illustrates the bond the Williams sisters share. "Serena Williams, that's my little sister guys. Congratulations Serena on number 23, I have been right there with you, some of them I've lost right there against you. I guess that's weird but it's true. It's been an awesome thing, your win has always been my win and I think you know that." "All the times that I couldn't be there, wouldn't be there, didn't get there, you were there. I'm enormously proud of you, you mean the world to me." Serena gave an equally heart-felt tribute to Venus. “I really would like to take this moment to congratulate Venus. She’s an amazing person. There’s no way I would be at 23 (titles) without her. There’s no way I’d be at one without her. There’s no way I’d have anything without her. She’s my inspiration — she’s the only reason I’m standing here today and the only reason the Williams sisters exist. So thank you Venus for inspiring me to be the best player that I could be and inspiring me to work hard”. Where did Serena gain the upper hand in this final? While the build up to the match was second to none, the contest as such didn’t make for a great viewing. And that was understandable. As the siblings stared across the court: one saw her younger sister who has won one of her last five majors chasing history while the other saw her elder sister who has just recovered from an autoimmune disease playing her first major final in 8 years. And they were expected to thwart each other! The contest was awkward at first and scratchy at best for it was harder for them to play. The tension was evident in their game but neither of them found release. After all, one of their wins would come at the expense of their sibling’s! This led to Serena smashing her racquet in the third game, and double-faulting thrice in the fourth. However, Venus never found her feet in the game. While the crowd got behind her every time she hit a winner, she would eventually smash one into the net. As Venus wasn’t able to make herself go for enough, Serena fared marginally better to gain the upper hand. Who started this great story? “Congratulations. I think you have found the next Michael Jordan”, Venus William’s first professional coach was congratulated after Venus overpowered a vastly superior competitor in one of her early tournaments.“No”, the coach replied, “I have found the next two”. The professional coaches had it easy though. 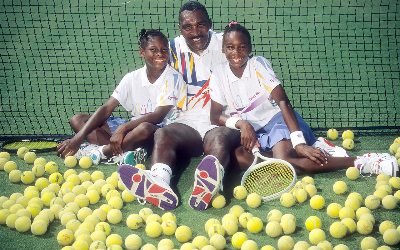 The Williams sisters had already been trained well by their father since they were aged 3 and 4.Richard Williams had decided - even before the girls were born - that the sisters would be world champions. A tenant farmer from Louisiana, Richard had no prior tennis experience. He used what he had gathered from tennis books and videos to instruct his girls on the different aspects of the game. At a time when the future champions of this privileged sports were practising under professional coaches in professional academies, an amateur Richard was training his daughters on public courts close to home. What was Richard’s motivation He saw a tennis match on TV and was shocked at the size of the check being handed to the winner. He thought this was a way out of poverty for his girls. He then wrote a 78-page plan, borrowed a shopping cart full of balls and taught his two youngest daughters the game. Not only did he teach them to dream big, Richard taught them to serve big and hit hard - at every ball. He also ignored the conventional path of having his daughters play junior tournaments. He was confident his daughters were getting ready for the seniors. In 1997, when an unseeded Venus Williams made the finals of her very first U.S. Open, Richard told, "Hey, my younger daughter is even better." It sounded like the talk of an unrealistic father. Those words were not of a fond father but a coach who knew his players well. The rest is sporting history. Richard has frequently spoken against racism in the United States. "I really just think a lot of people in the tennis and business world are jealous of me. They'd rather see me sweeping the floor at the U.S. Open or picking cotton somewhere. But I'm not." He has been controversial for his outspokenness. Sometimes he has spoken harsh words against his daughters’ opponents. Many claim he has “lost his mind”. He has been criticized for divorcing his wife and marrying a woman only a year older to Venus. However, it is undeniable that no other coach has achieved “so much with so little”. In July 2016, Richard Williams suffered a stroke prior to his daughters Venus and Serena winning Wimbledon. He is reported to be stable now. How will this impact Serena’s career? This was Serena’s seventh Australian Open title. This meant that she has now won 10 Grand Slams after turning 30. As she celebrated her unrivalled place in history, she received a congratulatory letter and a pair of custom-made shoes from Michael Jordan, the name most synonymous with number 23. As she looks at Steffi Graf through a rear view mirror, she now has her sights set on Australia's Margaret Court, the only player who has won more Grand Slams than Serena (though not in the Open era). Court has 24 Grand Slam singles titles.